Katy bought her lunch for the first time at school, today. 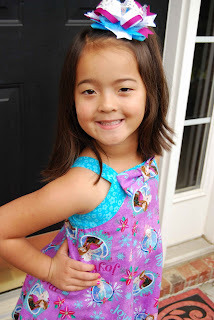 It was pizza day and she had been looking forward to going through the cafeteria line like a big kid ALL WEEK!! When I asked her how it was she replied very matter-of-factly, "Well, I won't be doing that again! The pizza was pretty yucky." Hahaha...! She quickly followed up with, "Maybe I'll try the hamburgers, next time. Even though I know they don't serve onions." That kid. She makes me smile. Even when she isn't trying. -The Victory Cheer Uniform is a two piece cheer uniform. 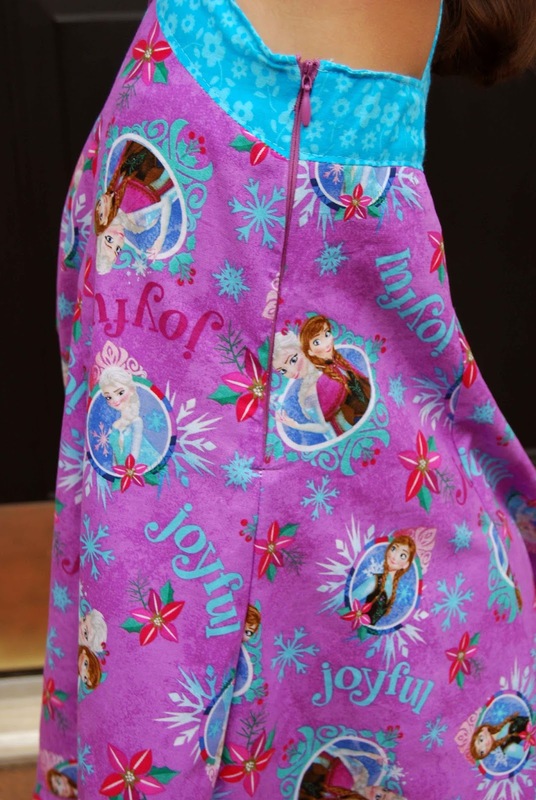 It features a top and a separate skirt. 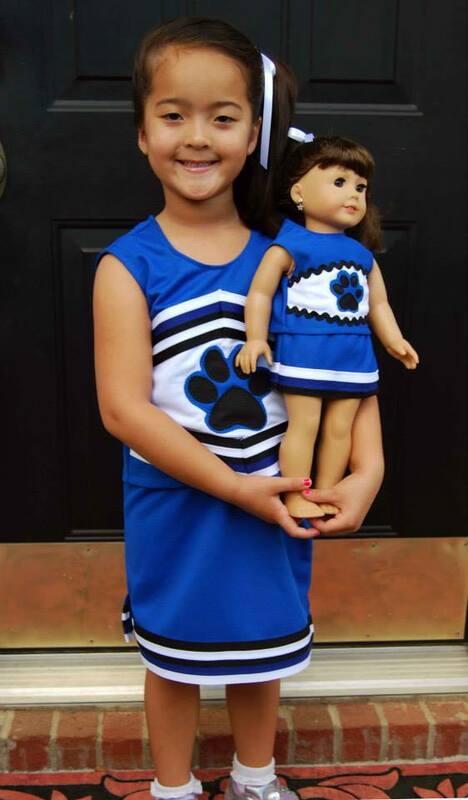 -The Victory Cheer Uniform is meant to be sewn using 100% polyester ponte knit fabric. -The Victory Cheer Uniform features two sleeve lengths- sleeveless and long sleeves. -The Victory Cheer Uniform features several skirt options- traditional shorter cheer skirt, longer skirt and instructions on how to do an optional side slit. -The Victory Cheer Uniform also includes pattern pieces and instructions on how to sew up some cute bloomers to wear underneath the uniform. 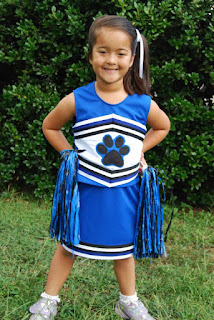 -The Victory Cheer Uniform also includes several suggestions for trim using cheer trim, striped knit fabric and layering ribbons of different widths. 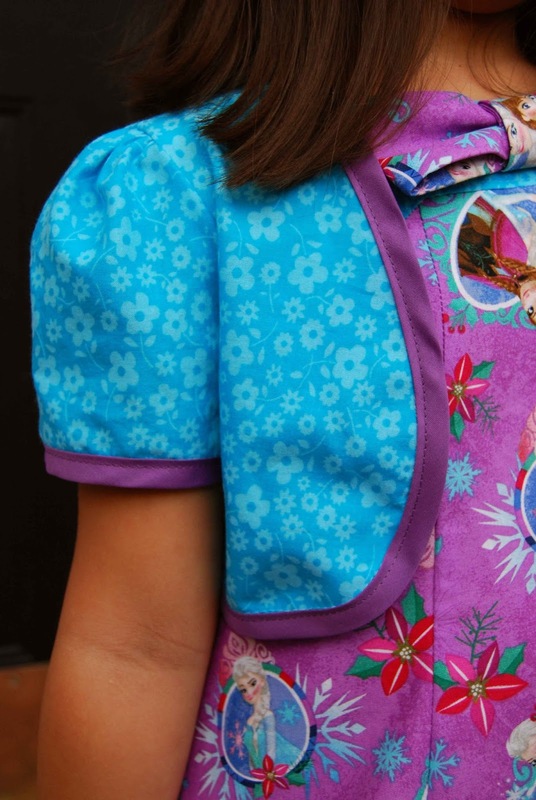 -The Victory Cheer Uniform features trimless pattern pieces. 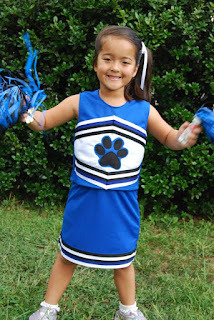 -The Victory Cheer Uniform PDF sewing pattern includes a glossary of terms, fabric requirements, sizing chart and elastic cutting chart. 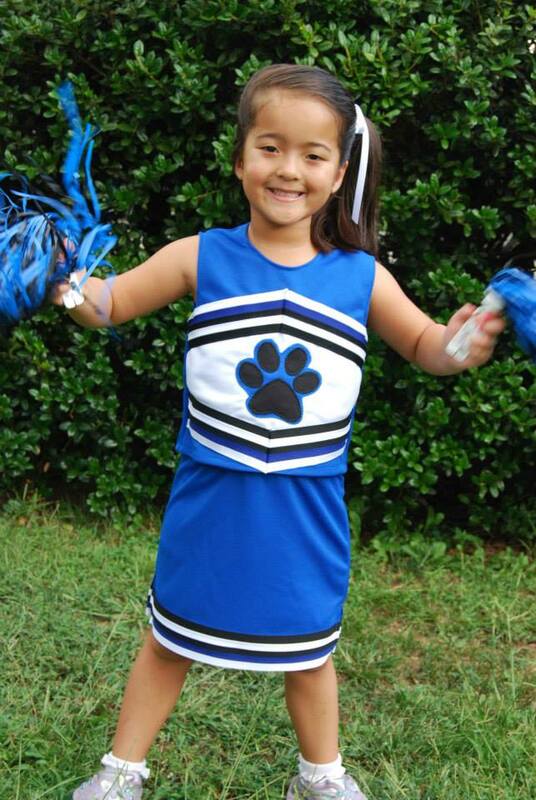 I sewed up a size six, sleeveless, longer skirt with side slit Victory Cheer Uniform. I purchased the blue, white and black ponte fabric locally at Hancock Fabric. The cheer trim was purchased directly from Cole's Corner and Creations. 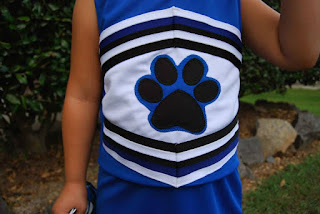 This was my first time sewing a cheer uniform, using ponte knit AND I did my first applique (paw print). 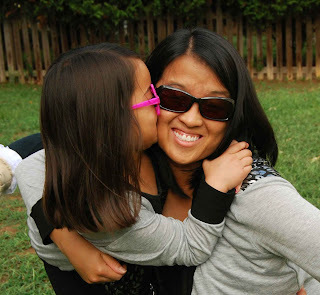 Lots of firsts (and so much fun!)! 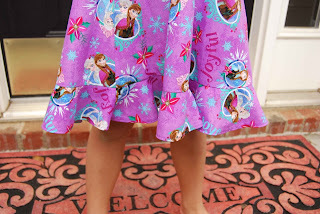 At first I was hesitant to try my hand at applique. 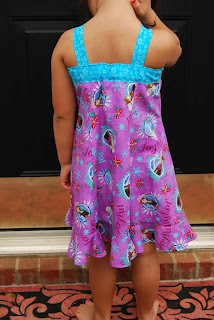 However, by just following the instructions included in the tutorial it was a breeze and I LOVE how it turned out! The Victory Cheer Uniform is close-fitting and uses minimal fabric. 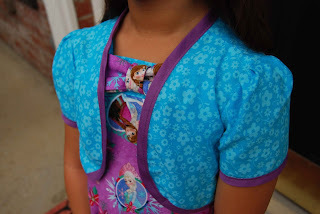 Ponte fabric isn't super stretchy, so, make sure you cut the fabric with the stretch going ACROSS the body. 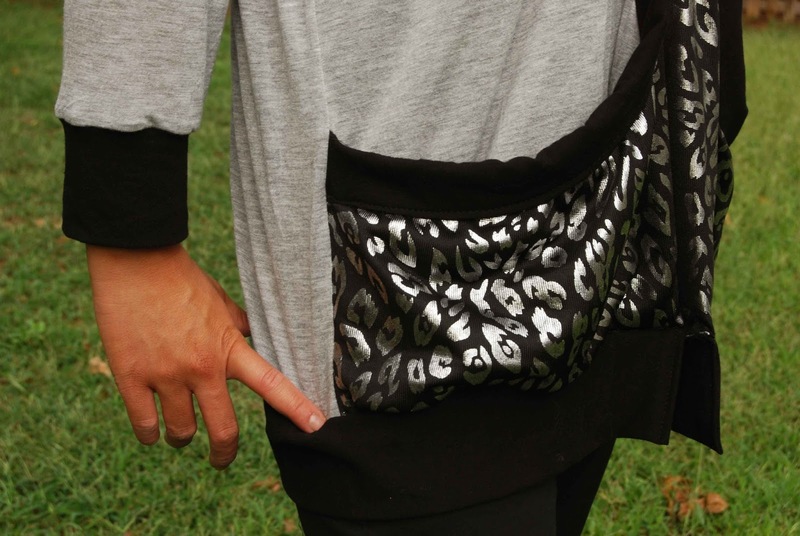 The trim design is totally up to you. So, my word to the wise would be, order more trim than you think you need (just in case!)! 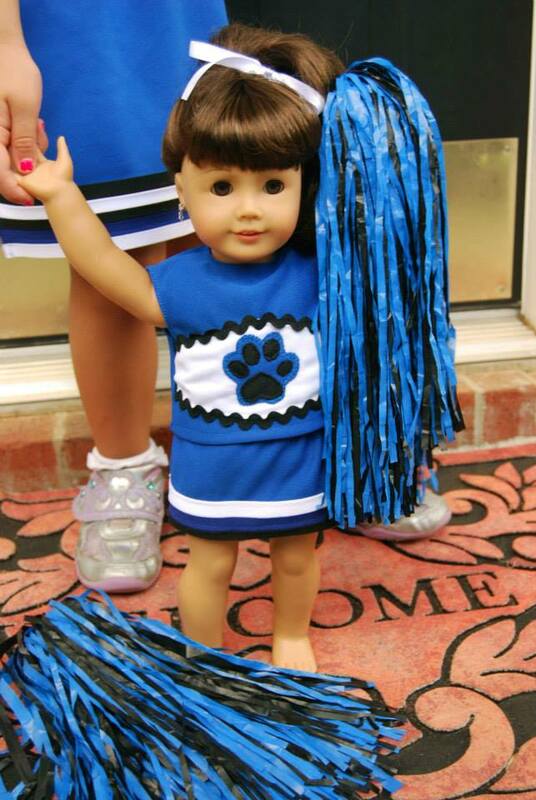 Lil' Miss LOVES her new Victory Cheer Uniform!! It's perfect for jumping and cheering! 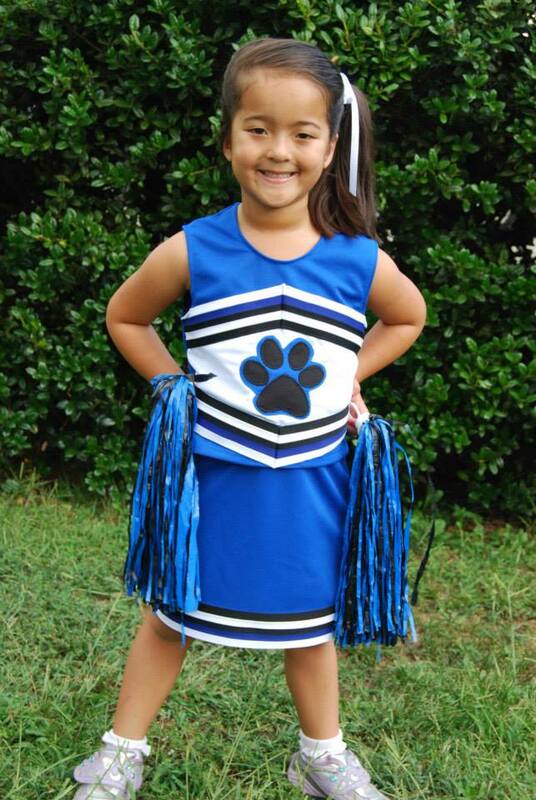 She'll be the cutest, best-dress kindergartner at school spirit pep rallies- don't you think?!! And, as an added bonus, with the longer skirt length and wide shoulder straps, it ALSO conforms to school dress code! Winner! Oh, and did I mention that there is a separate DOLLY Victory Cheer Uniform?!! How cute!! Dolly and Me matching cheerleaders! 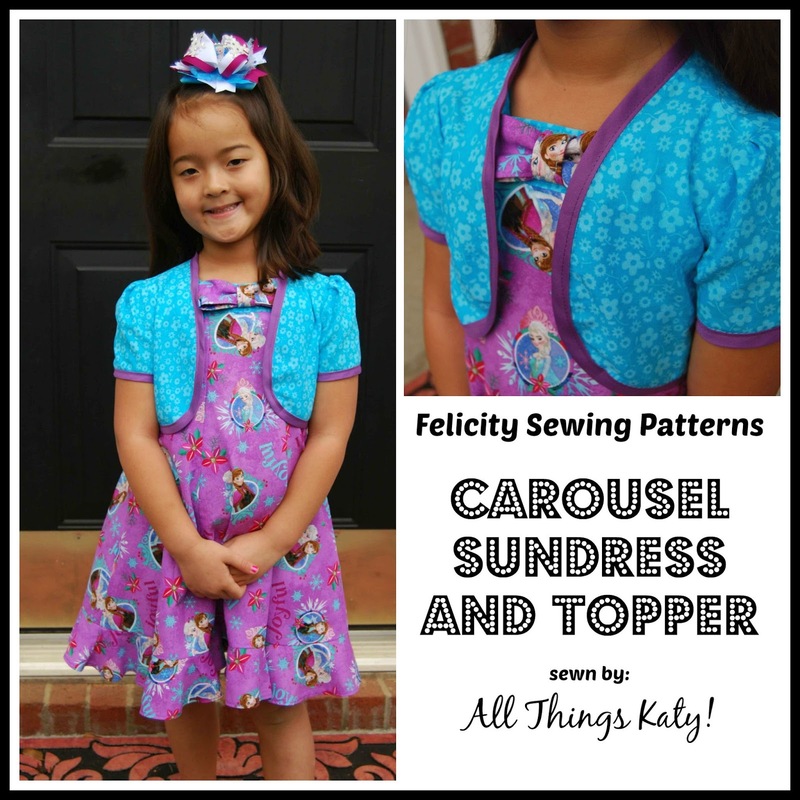 Now, go, run, jump and leap forth and sew your little cheerleader (and dolly) the newest pattern by Cole's Corner and Creations- the Victory Cheer Uniform!! 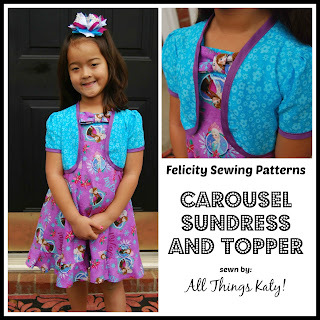 Sew much fun! 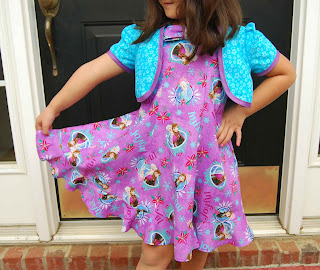 Thank you, Nicole, for another fun, quality pattern! School is back in session and the retailers are pushing everything pumpkins, Halloween, and- dare I say it- Christmas?!?! So, with that in mind, Happy Pumpkin Spice EVERYTHING season!! Hahahahhaha.... just kidding! Really, though, this has been our first week of cooler temperatures (aka under 80 degrees!) here in North Carolina and it's *just* starting to feel like cardigan season. The Little Lizard King- Ladies Library Cardigan designed by Cassie Massolia, is the perfect layering piece for chilly morning waits at the bus stop, a quick trip to the store and even an ac-frigid work settings. 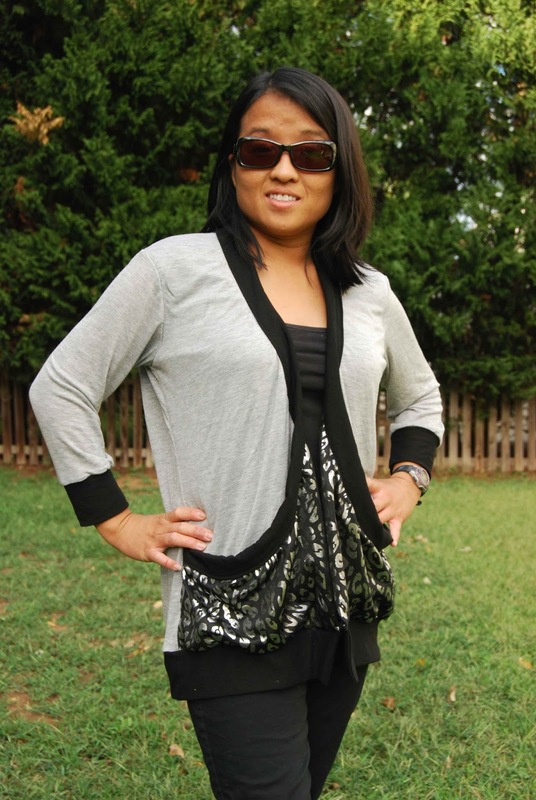 Featuring big, kangaroo pockets and constructed in comfy knit, the Little Lizard King- Ladies Library Cardigan is easy and fun to sew! -The Little Lizard King- Ladies Library Cardigan is sized for XXS-XXL. -The Little Lizard King- Ladies Library Cardigan features layered pattern pieces (ie print only the size that you want/need). -The Little Lizard King-Ladies Library Cardigan includes three lengths- hip, mid and boho tunic. -The Little Lizard King- Ladies Library Cardigan includes three sleeve lengths- short, 3/4 and long sleeves. -The Little Lizard King- Ladies Library Cardigan also includes an optional elbow patch, button tab sleeves and inset back detail. -The Little Lizard King- Ladies Library Cardigan tutorial includes notes on how to get a custom fit, a size chart, fabric requirements chart, binding cutting chart and pattern layout guide. 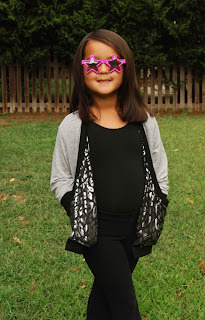 -The Little Lizard King- Ladies Library Cardigan features step-by-step photographs and written text throughout the tutorial. Personally, I would consider the Little Lizard King- Ladies Library Cardigan a more intermediate pattern due to the binding technique and use of knit fabrics. *Note, the only modification that I made to my card I was the bottom hem band. Instead of double folding the binding, I just folded in half, serger RST and called it a day. * However, there are lots of tips and help along the way, if an adventurous beginner is feeling brave. 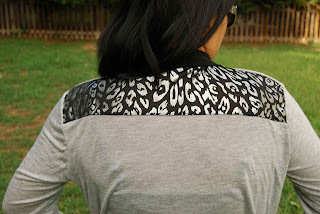 I can't say that the Little Lizard King- Ladies Library Cardigan took me all that long to sew. 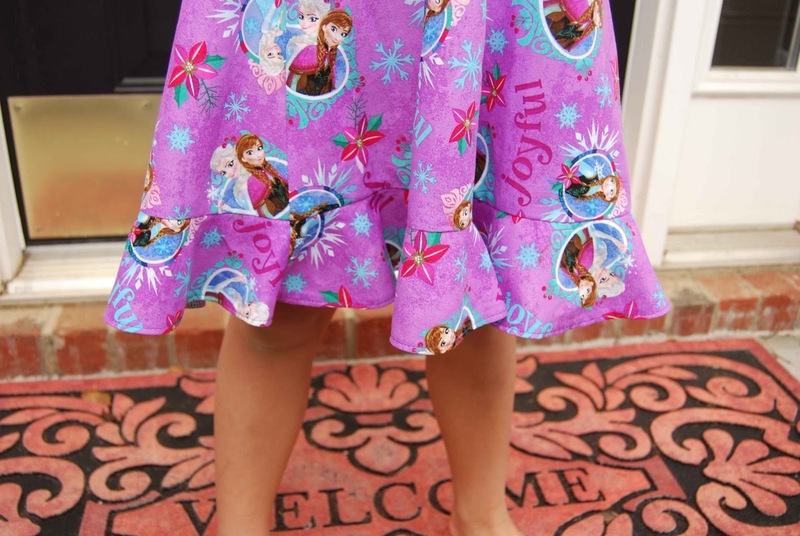 It actually took me longer to print/tape/cut out the pattern than it did to sew it. 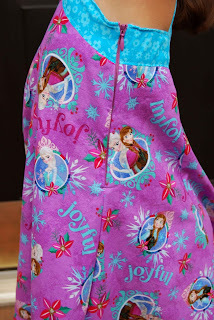 I did do a lot of switching between my regular sewing machine and serger for this pattern. One tip that I found especially helpful in sewing up the Little Lizard King- Ladies Library Cardigan is the fact that I basted (temporarily sewed together two pieces of fabric with a longer, looser stitch) the lining fabric to the main fabric for the front pocket pieces. This REALLY helped keep everything aligned properly in construction. 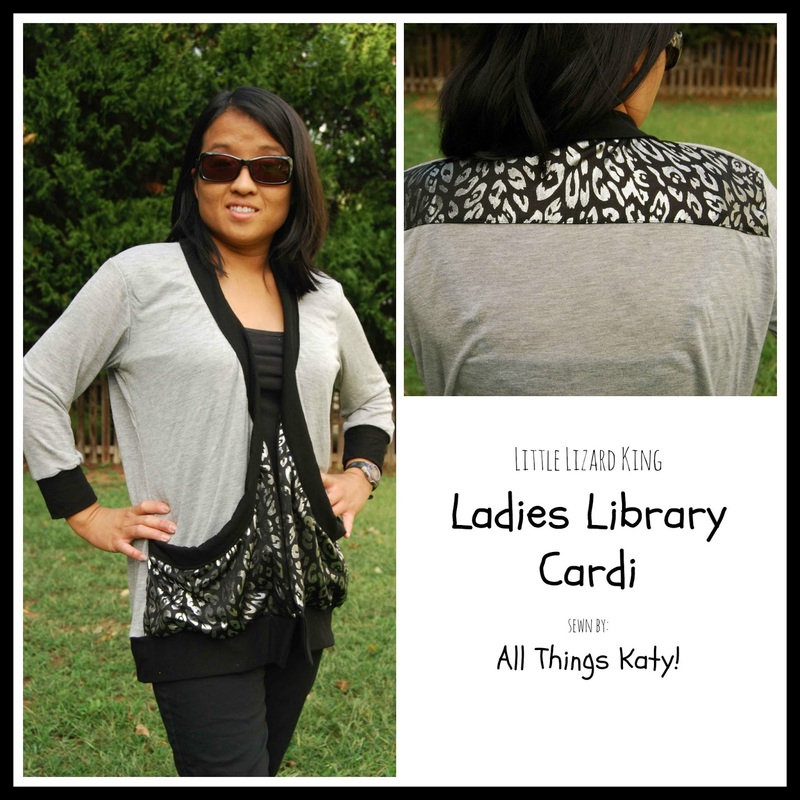 The Little Lizard King-Ladies Library Cardigan was a lot of fun to sew up! There are lots of ways to make the pattern your own and I know that I'll be making more of these in sweater knits, solids and more! Now, for those that know me best, I'm a pretty boring dresser. Black. Grey. Brown. Neutral. Sometimes, I add a little red because it looks good with my hair, but I'm definitely not an "animal print/loud pattern" kind of girl. B.O.R.I.N.G! Then I had my daughter. She loves it Pink! Sparkly! Shiny! Frilly! and FUN! 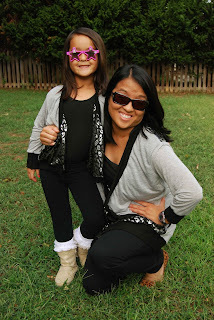 When I agreed to do the Little Lizard King- Ladies Library Cardigan blog tour, I just knew I HAD to do a mommy and me matching cardi set. (I mean, seriously- how could I not?!!). 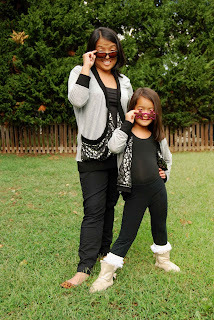 So, what's a boring mommy and a fun, sparkly girl to do...? Compromise, of course! I get my neutral grey and black with the main body and bindings of the Little Lizard King- Ladies Library Cardigan and Lil' Miss gets sparkly fun with the sparkly animal print liner/kangaroo pockets. Everybody wins! Speaking of mommy/daughter matching Library Cardis, I leave you with these fun pictures! Thank you, Cassie, for allowing me to sew up the new Little Lizard King- Ladies Library Cardigan! Sew much fun!